Kendall Rogers: Adam — That would certainly help Miami’s case. Right own, I think I have the Hurricanes behind some teams like UC Irvine and Arizona State, but there’s no doubt this team is much improved. That’s a huge series to kick off ACC play to say the least. Intrigued to see how the Canes look against the Jackets. Love the top of the lineup, the rotation is solid and I think Federman/Keysor, etc, are solid weapons at the back-end. Kendall Rogers: Robert — That is the one holdup I have with the Aggies. I’m still wanting to see if anyone in that lineup steps up and becomes a premier hitter. Shewmake certainly has that kind of potential, but even he struggled at times over the weekend at the Shriners tournament. With that said, the Aggies have one of the top 2-3 one-two punches nationally in the weekend rotation and the bullpen is absolutely loaded. A&M’s offense doesn’t need to do a ton — but it needs to do more than it is now, IMO. Reid Norton: What’s your early thoughts on this Gamecocks team? Very impressed with the bullpen and hitting but starting pitching still concerns me. Aaron Fitt: I don’t think South Carolina ever expected this club to rely on deep outings from its starters — Mark Kingston implied in the fall that the Gamecocks would do a lot of bullpenning, because the strength of their staff is the depth and variety of the bullpen. I think that formula can work just fine in this day and age. Certainly you’d rather have a healthy Mlodzinski, but they’ll be OK without him for a while. That bullpen is legit, and the hitting has been even better than I expected. Kingston really knows how to coach hitters — his teams always have an aggressive approach, and they always seem to get better at the plate as the year goes on. This hot start with all those new faces in the mix (along with some very good older guys performing well, of course) is awfully encouraging. Tyler: Hey guys. How does Texas go 4-1 on the week and move up 10 spots and jump Arkansas, when Arkansas goes 4-0? Just curious, thanks. Kendall Rogers: Tyler — Good question and a pretty simple answer. Texas just swept the No. 2 in the country and made it look pretty easy the first two games of the weekend. Those things happen. I was pretty impressed with the way Eric Kennedy and many of UT’s young players performed over the weekend. Duke Ellis also had a huge weekend for the Hors, while Bryce Elder was as advertised on Friday. I thought this was a bridge year for Texas, but this team is pretty dang good right now. Hunter Bishop: Spencer Torkelson and I make a pretty fearsome duo in our outstanding offense. How far do you see our Sun Devils progressing this season? Pitching has been great so far – granted it will need to hold up especially with depth concerns – and the offense looks elite. Omaha sleeper? Aaron Fitt: Yeah, we all knew Tork was a monster, but it’s great to see Bishop harnessing his huge raw tools early on too — he’s a rising star, clearly. You’re right, that offense is for real; I wrote two weeks ago that it might well wind up being the best offense in the country, and certainly I still feel that way, though the competition will get tougher. And I think the frontline arms there are good enough to win a lot of games, but the depth is indeed a concern, so they need to stay healthy on the mound. If they do, certainly I think they’re a viable Omaha sleeper. Marc Noland: Should I be concerned about LSU now especially starting pitching after this weekend performance in Austin? Kendall Rogers: Marc – It’s way too early for any fan base to press the panic button, but there’s no doubt LSU kind of concerned me this past weekend. I didn’t feel like the Tigers played with a ton of passion for a big series (Texas did), Hess showed flashes of greatness but was ultimately typical Hess, Marceaux is a freshman in his first start on the road (he’ll bless fine), I’ll give him a mulligan. And Eric Walker, I’m told was 81-84 mph with his FB. LSU still has some serious questions to answer on the mound IMO. FoundersPounders: Do you think Logan Davidson will go in the Top 10-20 picks in the MLB draft? Gamecock fan here, but he’s one of the most polished middle infielders I’ve seen. Definitely looks the part of a fast track college-MLB prospect. Aaron Fitt: Yes, I remain convinced that Davidson will be a first-rounder, maybe a top-10 pick. He is a very good defender who can run, hits for power from both sides, and draws plenty of walks, which makes me feel a little better about his high strikeout rate. Scouts have some concerns about the swing-and-miss, and about his struggles in the Cape, but his tools and his performance against high-level competition in the spring is just too hard to ignore. Interesting though — I expected a different kind of question about Davidson from SC fans today. Sounds like he provided some bulletin board material in the press last week, and from what I read, the Gamecocks took note. Brandon: Jackson Rutledge gets drafted in the top ten picks… what are the chances of that happening? Kendall Rogers: Brandon — gotta love a little JUCO question action. I like it my friend. I saw Rutledge twice in the fall and really liked him. Big, sturdy build and he was up to 98 with his fastball along with that power curve. He was awesome one outing and average the next with his command. I think getting drafted THAT high is a stretch at this point, but I’m never going to rule anything out this early. Ben: Who would you list as the top 5 1-2 Starting pitching combos this year? Small/Ginn has to be #1, right? Aaron Fitt: In no particular order — it’s too early to split hairs too that finely — I definitely would have Small and Ginn in there, along with A&M’s Doxakis and Lacy. I think UNC’s Dalatri/Bergner/Baum belong in this discussion no matter what order you put them in, they’re all really good. I think Detmers and Bennett at Louisville have played their way into this mix too. And I’ll put Drew Parrish and CJ Van Eyk in the mix as well. Tennessee could be the dark horse, with Stallings and Linginfelter. I think that’s a legit duo as well. Vols could have staying power in the rankings. Aggie Hopeful: You had John Doxakis as an early 3rd round pick in your preseason prospect report. Still too early, but where do you think he will end up by year end? Kendall Rogers: I could see Doxakis being a second-round pick before it’s all said and done. The delivery might not be the prettiest in the world, but he’s a hard-nosed guy with a really solid slider, the FB is sitting 90-93 this year, and the changeup can be a very solid pitch, too. He looks the part, that’s for sure. What’s interesting is that Asa Lacy profiles even better for next year IMO. Spear15: It is early and the schedule has been weak to this point, but do you believe this is the best lineup we have seen at Florida state in some time? Aaron Fitt: I’m not ready to say that — they’ve had so many great lineups, year after year after year… But I do really like the personnel in that lineup. Great to see J.C. Flowers off to a strong start, he’s obviously a talented guy who is figuring it out. Robby Martin is just a straight-up masher, one of those FSU guys who’s gonna put up huge numbers in his career. Mendoza, Cabell, De Sedas and Albert are all high-level prospects. And Matheu Nelson is starting to pick it up after a slow start, also encouraging. Nice role players here too — Cooper Swanson had a big weekend for the Noles. Good depth in that lineup. Like you said, the competition hasn’t been elite so far, and there will be bigger tests ahead, but the early returns are very promising. HburgGator: As a Gator, I enjoyed the weekend series over Winthrop, however I’m starting to get real concerned about opening SEC weekend in Gainesville with the Bulldogs coming to town. I know its early, but can you preview this matchup a little bit? Kendall Rogers: HBURG — I wouldn’t be worried. Florida will be ready to roll at home and I’m expecting that weekend rotation to be Mace/Leftwich/TBA(Dyson) by that point. Meaning, the Gators still matchup pretty well with the Bulldogs. Granted Winthrop isn’t a world beater, but 45 plus runs over the weekend was pretty impressive. MSU is very good and is pitching at an incredibly high level, but I’d be shocked if Sully doesn’t have UF ready to go. Jack: How concerned are you about Texas Tech after how they played last weekend? Aaron Fitt: I’m not really concerned about the Red Raiders. It was weird to see that offense go AWOL this weekend, just seven hits in two games is very uncharacteristic — but chalk it up to a bad weekend in awful weather conditions against good pitching. The Raiders are going to hit, you can bank on it — there’s too much talent and experience there, and they’re too well coached. The pitching staff will probably wind up mixing and matchup a lot, because there’s plenty of depth, but Erikson Lanning is a nice reliable veteran strike thrower who can eat innings in the rotation, and I still think good things are ahead for Caleb Kilian, who battled through the flu this weekend. Lots of power arms in that bullpen; they’ll be fine on the mound too. JoeBruin: Hey guys, loving the coverage through the first three weeks of the season so far. I wanted to get your thoughts on the Bruins? The pitching has been great, even without ace Ryan Garcia, but the bats have been somewhat dormant (especially Strumpf and Toglia). When you look around the PAC-12, it seems like everyone is scoring A LOT. Bruins going to be fine? Kendall Rogers: Joe — I tend to think so. Strumpf and Toglia are supremely talented players, so conventional wisdom would suggest those two will get it going at some point. With that said, the Bruins have pitched at such a high level, they have some flexibility with the offense. I’m not worried at all about UCLA against some of those offense-heavy clubs out there. Aaron Fitt: Well shoot, I didn’t know Kendall was answering this one, but I have an answer too (which is mostly the same), but I’ll put it here anyway! This is another one of those “small sample size” things — I still believe UCLA’s offense will be elite, because the offensive talent might be as good as any team’s in the country. It’s a long season, players go through little funks, and it just happens that Toglia and Strumpf have come out of the gate cold, but they have great track records and high-end talent; they’re going to hit. So will McLain and Kendall and Ydens. Lots of really good players in that lineup; just be patient with them, an offensive explosion is coming. In the meantime, it’s been good to see Jake Pries and Ryan Kreidler and Garrett Mitchell take steps forward with the bats. Clemson: How concerned should Clemson be about the lack of reliable starting pitching right now? Their “best” start this past weekend was Freshman Davis Sharpe’s 3.2IP 4ER outing. Sammy: What do you guys think of UNCW’s unfortunate start? Are their at-large hopes already dashed? Aaron Fitt: Definitely not a great start for the Seahawks, and they probably did need to win more of those preconference games in order to put themselves in good at-large position — but they’re still 6-6, so it’s not like they’re completely buried. They’re capable of getting hot and making a run in conference, and I think there’s certainly still a shot for an at-large. I think the way Luke Gesell and Gage Herring and Landen Roupp have pitched is encouraging — that rotation should e competitive in conference, and they’ve got solid depth on the mound too. We knew the offense would be a work in progress because they lost a lot from last year, but the Seahawks usually figure out how to hit, it’s in their DNA. They need Kep Brown and Gret Jones to get hot, those guys have impact talent obviously. William : Is JT Ginn the early front runner for Freshman of the Year? And what lengths does Mississippi State go to when managing him in terms of keeping him sharp come June? Simply keep a low pitch count or maybe give him a few weekends off? Curious just how cautions Lemonis & co. will be. Thanks fellas! Aaron Fitt: For me he is — he’s just so polished for a freshman, in addition to having great stuff. I love a freshman with the maturity to pitch to contact early in counts, knowing that that heavy sinker will get plenty of ground balls, and he can put really good hitters away with that nasty slider. I like how MSU has managed him so far, keeping him in that 80-90 pitch count range. I’m sure he’ll get built up a little bit more, but as long as they don’t ride him too hard, there’s no need to give him any weeks off. Kendall Rogers: Duck — I thought the Pac 12 would be deeper than last season, but I’m beginning to really like some of those “middle tier” teams in that league. I’ve actually heard good reviews on Arizona, Arizona State is clearly better and Oregon swept LMU this past weekend and has accrued some really impressive wins already this season. I’m comfortable saying I think UO is a regional quality club at this juncture. Then you have those other Pac 12 teams at the top. The SEC is also deeper than I thought. Tennessee is looking very balanced and strong right now, and Alabama is sneaky. The Tide sweeping South Al on the road surprised the heck out of me with Brock Love tossing a gem. Missouri is the only team in that league not looking so hot at the moment. Matt: Arkansas??? Come on guys why aren’t my OmaHogs getting any love?!?! Yea I know winning fixes everything. i also know we lost some grade A talent last year. But i also know we got some guys that have stepped up and showed out! It is like DVH just reloaded. Aaron Fitt: The Hogs have faced OK but not great competition so far, so they got jumped by Texas (which swept the No. 2 team in the country). Most of those teams at the top keep on winning, so there’s just not room to move Arkansas up more, unless we hammered LSU and Texas Tech even more than we already did — and it’s too early to hit them that hard (11 spots is harsh enough). Anyway — you’re right, Arkansas has reloaded very well, and it’s not like they didn’t have excellent talent returning already. Great start for the Hogs, definitely a bona fide contender in the SEC. OwlFan: Do you think rice’s performance the last two days was an aberration or a turn of the corner? Kendall Rogers: Owl — As my dad used to say, ‘the proof is in the pudding’. We will see how the Owls do later this week when they host a really solid Oklahoma team down here in Houston. But the last two days , the Owls looked like a much different team. The energy level just looked different, and Jackson Parthasarathy and Evan Kravetz threw really well. My man Justin Collins also was terrific over the weekend. Though this team looked different the past two days, we’ll see how things progress moving forward. Baseball fan: Are there any updates to your heat sheet? I heard Pitt’s Derek West was up to 97 this past weekend. Aaron Fitt: We have four new additions this week — the new heat sheet will be posted shortly, so keep an eye out for that. Remember that the rule is one of our writers has to be there to see it in person in order to make the list, so even when we get reliable reports (for instance, I heard Tennessee’s Andrew Schultz touched 100 this week), we can’t add it unless we’re there. But that doesn’t surprise me about Derek West, he’s got a big arm, always has. JD: Oregon State pitching stayed lights out but the bats went on a little Vacation!!! Thoughts moving forward with the Beavs? Carson: Who yall leaning towards for the Miami/GT series this weekend? Aaron Fitt: I think that’s a really intriguing series to kick off ACC play — two teams I am quite high on, who have both gotten off to pretty good starts. Whoever wins it could well find itself in the Top 25 next week — I think they’re both Top 25 caliber teams, to be honest. I suppose I’d give Miami a slight edge at home, but that one should be fun to watch. Jason: Minnesota is off to a rough start, how much do you read into this? Kendall Rogers: Jason — Well, do I think Minnesota will be a good team at some point this season? Absolutely. They were impressive in my one-game sample size out in Surprise a few weeks ago. But there’s no doubt they are experiencing some tough luck. The problem now is that Minnesota is so far behind the eight ball from a record standpoint it will need to roll through the Big Ten to have any chance at all of making the postseason. The Gophers doing that wouldn’t surprise me at all. Troy: What does a team like Dallas Baptist need to do to get ranked? Love your stuff guys. Aaron Fitt: The Patriots are definitely on the radar — they were our preseason pick to win the Valley, and we like their talent. They have two nice series wins on the ledger, a sweep of Kent State and two of three from Minnesota (who has scuffled but still has talent). 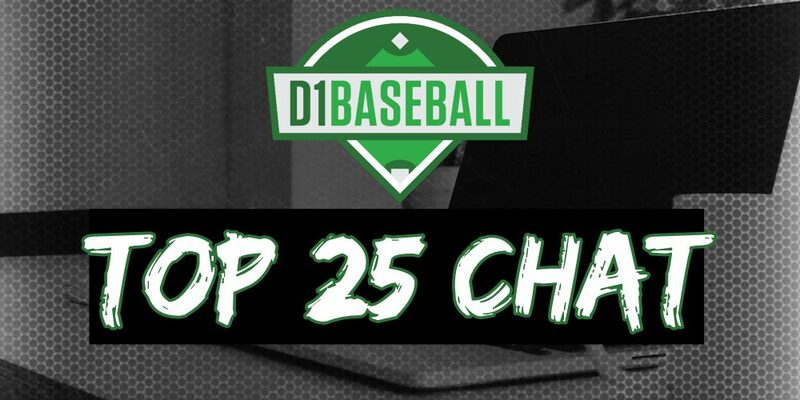 It’s just a crowded field of candidates for those Top 25 spots, not easy to squeeze in there. If DBU keeps winning, it will find its way in at some point. A midweek game against Oklahoma and road series at ORU offers another nice resume-building chance. Coogs: What are your thoughts on Houston going forward? They just can’t seem to get it together at the Shriners classic in any year. But would love to know your thoughts on them and conference play coming up later this month. Pitching is still my concern there. Kendall Rogers: Coogs — You are right, the pitching is the concern here. I think guys like Grayson Padgett and Co., will have as the season progresses. But Carter Henry being banged up really, really hurts, and I know Todd Whitting was really excited about Derrick Cherry, who was up to 95 in the fall. Guys like Freddy Villareal must have strong seasons if the Cougars want to meet expectations. Sean: A couple weeks in any thoughts on the WCC teams? USD looks much improved from last season. St. Mary’s and Gonzaga look solid too. Aaron Fitt: I was really high on Saint Mary’s heading into the season and after the Gaels swept Wazzu in a four-game set to open the year, but they’ve lost six of their last seven since then, so they need to regroup. USD seems improved, great week for those guys — looking forward to seeing the Toreros in Seattle this weekend. I like BYU’s veteran club too, and still think USF’s big arms will make them a factor, and I expect Gonzaga and Pepperdine to heat up after starting off with losing records through three weeks. But how about Pacific at 9-2? That’s a club we need to start paying attention to after winning series from Sac State and Seattle, definitely a team of interest in an already crowded WCC picture. As always, that league will be a free-for-all. Grayson G: If the reigning Big 12 Pitcher of the Year Cody Bradford can’t get healthy, what do you think the Baylor Bears ceiling is this year? Kendall Rogers: Grayson — I think Cody will be fine moving forward. Clearly, the Bears are being very safe with his pitch count right now. But he was up to 92-93 mph with his FB along with solid stuff in a short stint yesterday. But yes, if the Bears for whatever reason don’t have Bradford in league play, that’s a tough tough loss and would require some inexperienced arms to step up in roles they might not be ready for just yet. I think Cody will be fine, though. GoPack: NC State went 4-0 against some good teams this week and jumped into to the rankings. What’s striking to me about this team is the pitching depth. Legitimately used 12 different arms in key roles this week. My thought all weekend was this could be structured like 2018 Texas Tech where they weren’t getting deep starts, purposely at times, but just had so many options and good power options. Thoughts on that comparison? Aaron Fitt: Yeah, that’s the way the game is trending — we talked about it earlier in this chat with South Carolina. So having pitching depth is probably more important than ever, because you can succeed by mixing and matching with 12 guys if you don’t have three weekend rotation horses. That said, give Jason Parker and Canaan Silver credit, they turned in quality starts this weekend, which takes a lot of pressure off the bullpen. But boy, that bullpen is legit. Great to see Dalton Feeney back in action and having success — love the Feeney-Klyman duo at the back, two very different styles. Chip: Texas drew 22 walks and stole 6 of 7 in 3 games vs LSU. Now they go to Stanford who is averaging 3BB:10K per game as a pitching staff and their catcher does well controlling the run game. How do you see this series shaking out? Split? 3-1 and who? Kendall Rogers: Chip — I think a series splits sounds like a good bet right now, but this weekend is a much different challenge than LSU for the simple fact Texas has to go on the road to face an elite team with so many young players. That’s a fascinating series. James: UNC pitching seems to be performing as advertised but the offense has struggled against the best pitching staff they have faced so far (USF). Do you expect the offense to hit closer to the Xavier/Umass Lowell series or more towards the USF series as they enter ACC play. Outside of Freeman, Busch, Harris, and McGee there has been a lot of moving parts and mixed results. Aaron Fitt: I think all the moving parts are part of the design there — it’s a very deep group of position players, and UNC used its bench liberally last year too. They’re going to get contributions from a lot of different guys all season long, playing matchups, using pinch-hitters and pinch-runners and defensive subsitutes. But the Busch-Freeman-Harris-Martorano-McGee group is a nice stable core to build around, and Jackson Hesterlee has been really good too — he provides a nice veteran power presence in there. Obviously ACC pitching will present a bigger challenge, and the numbers will settle back to earth some, but this is a good offense. Guest: How is Arizona state still receiving no love? Aaron Fitt: The Sun Devils were Team No. 26 this week — we just went with teams that have played better competition. But last week NC State was team No. 26, and now they’re ranked. ASU is knocking on the door. Frodo: What has Tennessee done to deserve a top 25 spot? They’ve played nobody. They’ve also done this before where they feast on bad competition in the non-conference season and then get blasted in SEC play. I hope they enjoy playing at the Hoover Met tomorrow night vs Troy because the Vols will again miss out on the SEC tournament, even with Missouri being ineligible for post season play. You guys never seem to learn! Aaron Fitt: Sweeping Indiana was louder than anything many other teams in the Top 25 have done so far — the Hoosiers are going to be good. And there comes a point where you just can’t ignore the sheer dominance of that Tennessee pitching staff, even though some of the other competition hasn’t been as strong. We’ve seen all those arms, and their talent is real — now they’re performing up to that talent. Yes, I’ve been burned on the Vols before, and I’m not 100 percent ready to say this is a regional team yet — still have things to prove, and that league is a meat-grinder. But I will definitely take that bet about the SEC tournament… and I feel like this is a very legitimate postseason contender. Teddy: what are you’re feelings about Louisiana Tech baseball? Kendall Rogers: TEDDY — I think the Bulldogs are going to have a strong spring. Aaron and I actually struggled with the Rice/La Tech combo when it comes to the C-USA standings and our postseason field of 64 (in the preseason). I really liked La tech on paper coming into the season. Sitting at 9-2 and with David Leal still scheduled to come back soon, I think the Bulldogs have a strong spring and put themselves into postseason shape. I’d probably have LT ahead of Rice in my pecking order as of today. Erik: Aaron, you were down at the Frisco Classic. Nebraska put together two good showings, despite blowing a seven run lead. Is this something fans should be encouraged about moving forward or just a good week? Aaron Fitt: Yeah, I think it was encouraging. That Saturday loss stung, but I saw plenty of good ABs from the Huskers, and plenty of fight. They pitched very well against a great offense Friday, and there are plenty of solid hitters in that lineup. Schwellenbach is going to be a stud, Hallmark is figuring it out, I like Palensky, and Mojo Hagge is the man. Brian: Which non-power five has the best chance to make a deep run in the postseason? Kendall Rogers: Brian – The team that is starting to really intrigued me is UC Irvine. Tanner Brubaker, Trenton Denholm and Andre Pallante hare done a nice job this season and that’s a very, very strong weekend rotation, which to me, is the key to the postseason. I’ve also heard very solid things about UCI’s offensive style from the Rice staff over the weekend. I’d keep an eye on Orloff’s Eaters. I still think USM will get it going at some point, but I’d be lying if I said I wasn’t concerned about the weekend series against Gonzaga. Brandon: As always guys, thanks for such great content all year. I love following D1. Can you talk about Tech dropping 11 spots? Not the best of weeks for us I know, but it seems like quite a fall. We still picked up a “sneaky solid” shutout win in the midweek game. Compare our week to Florida’s a couple weeks ago who lost a couple of games to directional schools (non power 5) and barely dropped. If any other top 5 team has a losing record from here on out, can we expect a major drop like Tech had? Aaron Fitt: Definitely more of a harsh drop than Tech deserved, but part of that was the dreaded “poll dynamics” — the rankings had stagnated a bit early because everybody kept winning, so this was our first real chance to shuffle things up and reward some teams that deserved to move up. Also, the fact that Tech only had 7 hits in two games was dispiriting. Finally, we value weekends much more than midweeks, always have and always will — Florida still won a nice weekend series against Miami after those two midweek losses, which cushioned their fall. Anyway, it’s a long season, and I still believe in Tech as a national title contender, but right now there are a dozen other teams that also have talent and have earned better rankings. Rob Bible: I know there is a lot of baseball left to be played, but do you think Southern Miss gets out of this slump? Or do they miss the tournament entirely this year? Aaron Fitt: I’m probably more concerned about Southern Miss than Kendall is — I just saw serious issues with the defense and the offense last weekend in Starkville. I think they’re capable of turning it around, but it wasn’t like one of those weekends where you lose two out of three but still pass the eye test. I walked away wondering if maybe we just misjudged USM in the preseason. Time will tell, and I have a feeling USM will get right in C-USA… but I have less conviction about that that I did a couple weeks ago. HawkTalk: JJ Bleday and Austin Martin are off to blazing starts for the Commodores… and their combined numbers are basically slightly ahead of Andrew Vaughn (OK, maybe that’s hyperbole, but still). How is Vaughn a Bo Jackson Tecmo plus up-up-down-down-left-right-left-right-B-A-Start all in one person. Who was the last player to have as dominant a 13 month run as he’s had since the start of last year? I mean, Kris Bryant never had this kind of BA and K:BB success. Aaron Fitt: Great question — what a bonkers run Vaughn is on. As for the last guy to have a run like this, I’d have to think about it more, but Buster Posey? Dustin Ackley? Rickie Weeks? He’s in the conversation with those guys, some of the greats of the 64-team era.